Remains of the child suggest an ‘unknown European invasion of Siberia deep in ancient times’. New DNA findings, if confirmed, have stunning implications for our understanding of both pre-historic Siberians – and native Americans. They would suggest that, contrary to previous understanding, some indigenous populations are – in fact – European or West Asiatic in origin. The Danish-US research was carried out on the bones of a Siberian boy whose remains were found near the village of Mal’ta close to Lake Baikal in the 1920s in a grave adorned with flint tools, pendants, a bead necklace and a sprinkling of ochre. The remains are held in the world famous Hermitage Museum in St Petersburg and analysis of a bone in one of his arms represents ‘the oldest complete genome of a modern human sequenced to date’, according to Science magazine. The research may help explain why ‘European ancestry previously detected in modern Native Americans do not come solely from mixing with European colonists, as most scientists had assumed, but have much deeper roots’, said the report. 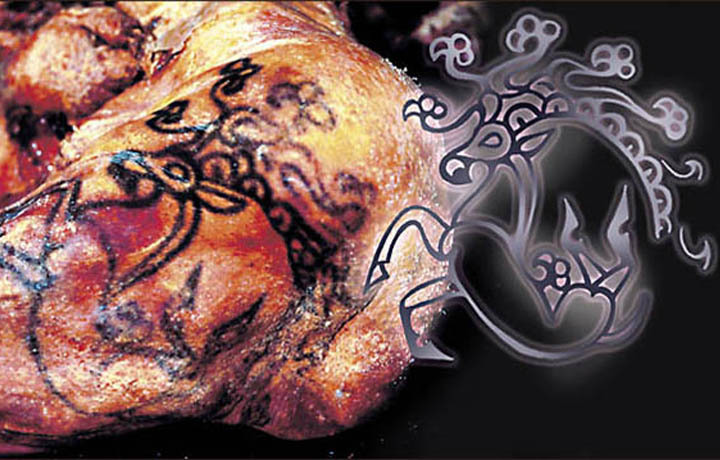 It may also raise a similar question about the ‘European look’ of some ancient Siberians – for example in the tattooed permafrost princess Ukok found in a burial chamber in the Altai Mountains, whose remains date from around 2,500 years ago. Russian scientists reconstructed her to show what many were surprised to be a European face, unrelated to the modern day Altai tribes. The finding is confirmed by DNA analysis which showed her to be Pazyryk in origin. Her group was part of the Samoyedic family, with elements of the Iranian-Caucasian substratum’. The four year old boy was found near the Belaya River close to the village of Mal’ta which is famed for the discovery of ancient art, some of it showing close links to European discoveries of the same period. Willerslev and co-author Kelly Graf of Texas A&M University ‘used a variety of statistical methods to compare the genome with that of living populations. ‘They found that a portion of the boy’s genome is shared only by today’s Native Americans and no other groups, showing a close relationship. 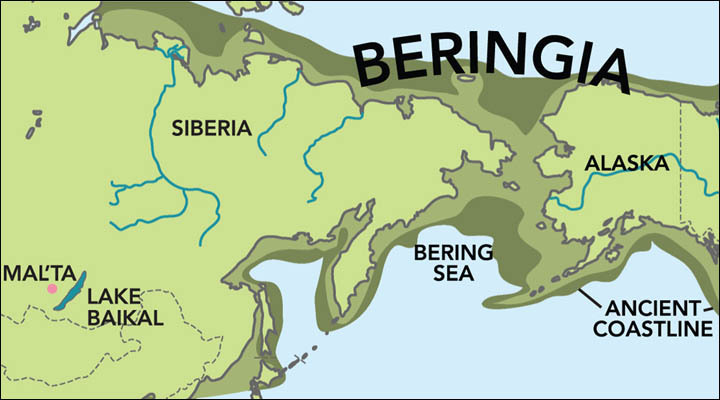 Until now it has been widely believed that Native Americans were linked to Eastern Siberian tribes, having crossed Beringia, a vast Ice Age land bridge. The magazine report stated: ‘One expected relationship was missing from the picture – the boy’s genome showed no connection to modern East Asians. 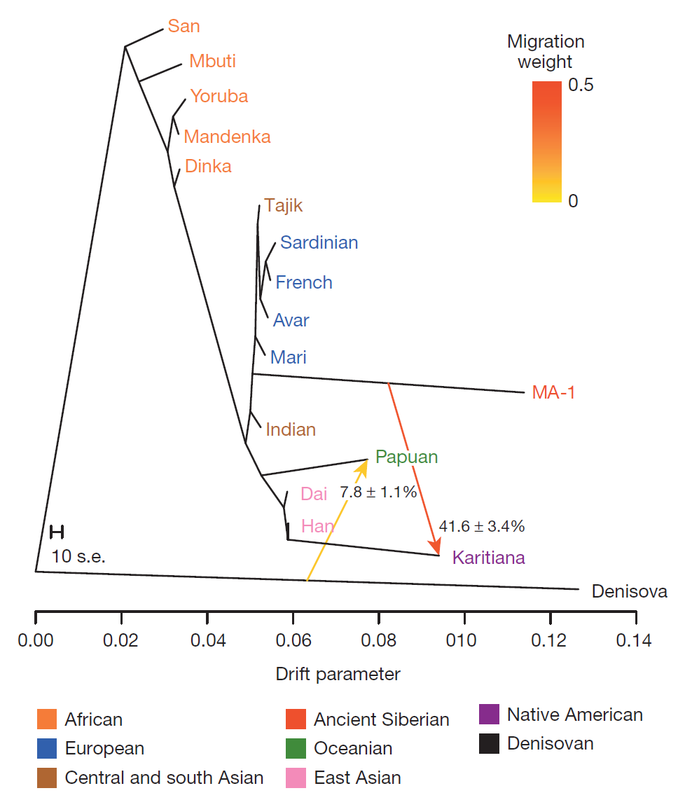 Willerslev and his team propose that earlier than 24,000 years ago ‘the ancestors of Native Americans and the ancestors of today’s East Asians split into distinct groups. 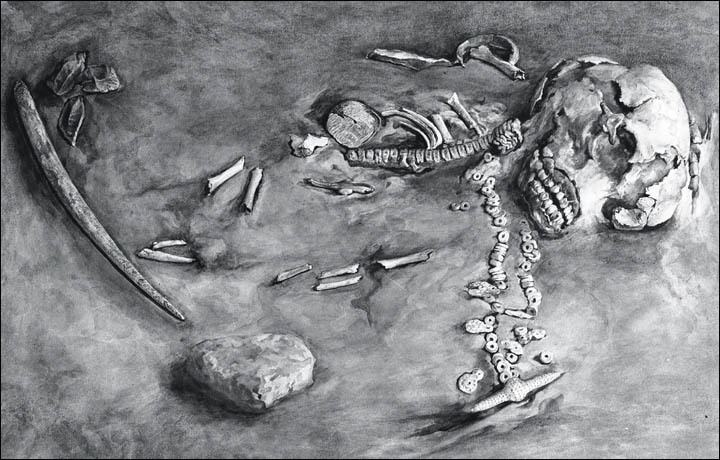 The timing is uncertain but ‘the deep roots in Europe or west Asia could help explain features of some Paleoamerican skeletons and of Native American DNA today’. 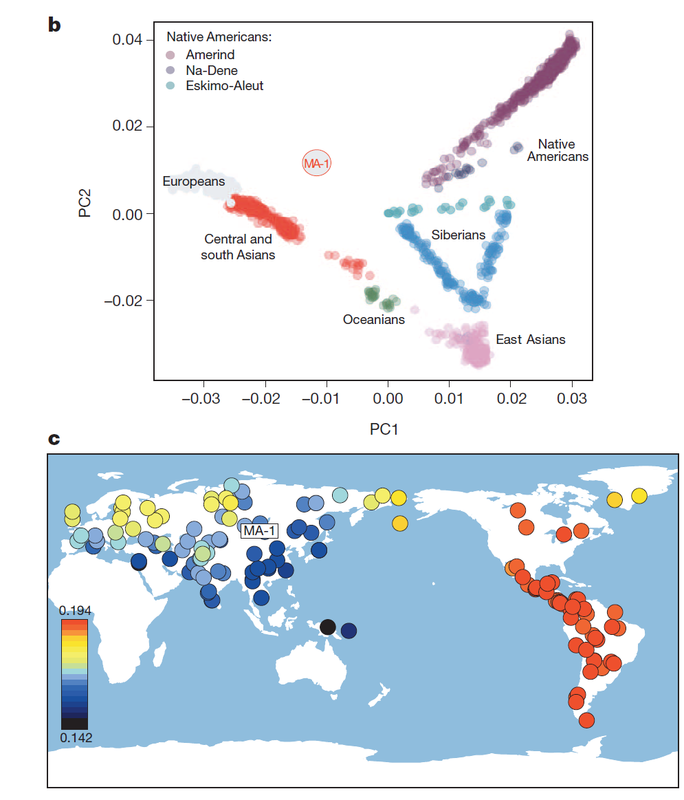 Some of the traces of Eurasian genetic signatures in modern Native Americans do not come from colonial times when incoming Europeans mixed with the indigenous population. ‘Some of them are ancient,’ said Willerslev. Geneticist Connie Mulligan of the University of Florida called the findings ‘jaw-dropping’. Yet perhaps the findings – the full details of which are due to be published soon in Nature journal – are not so surprising. Famed Russian archeologist Mikhail Gerasimov found art work at Mal’ta which show a close resemblance to European female figurines of the Upper Paleolithic period. The similarities extend to tools and dwelling structures. The study I mentioned in a previous post has now been made available in Nature. Two Upper Paleolithic Siberians (24-17kya) have been sequenced at low coverage. The better quality (and older) Mal’ta (MA-1) sample belongs to Y-haplogroup R and mtDNA haplogroup U, and the younger (but poorer quality) Afontova Gora (AG-2) sample appears to be related to it. It is fascinating that such a sample could be found so far east at so early a time. Both Y-chromosome R and mtDNA haplogroup U are very rare east of Lake Baikal which has been considered a limit of west Eurasian influence into east Eurasia. And, indeed, both these haplogroups are absent in Native Americans, so it is not yet clear how Native Americans (who belong to Y-chromosome haplogroups Q and C and mtDNA haplogroups A, B, C, D, X) are related to these Paleolithic Siberians. The obvious candidate for this relationship is Y-chromosome haplogroup P (the ancestor of Q and R). So, perhaps Q-bearing relatives of the R-bearing Mal’ta population settled the Americas. In any case, this is an extremely important sample, as its position in “no man’s land” in the PCA plot (left) demonstrates, between Europeans and native Americans but close to no modern population. We already knew that Tianyuan was more Asian than European, so I think west Eurasians diverged from the rest >40 thousand years ago. But, Tianyuan was so early that its precise relationships to different Asian groups could not be determined. So, I’d say it’s a good guess that east-west split off before 40 thousand years in Eurasia.